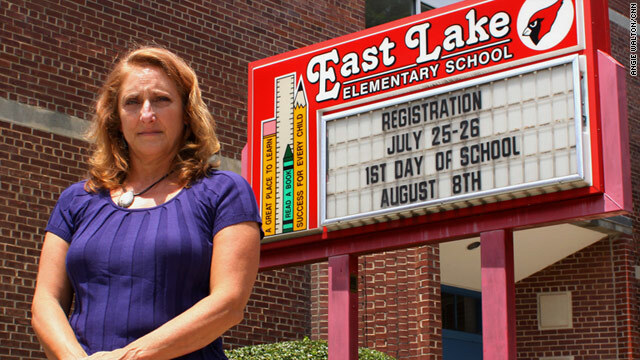 Teacher Julie Rogers-Martin left Atlanta's East Lake Elementary School when she suspected cheating. Atlanta (CNN) -- Julie Rogers-Martin had started to doubt her teaching skills. After 30 years in education, working mostly with underprivileged inner-city students, Rogers-Martin felt she had developed a level of competence and professionalism that can only be gained from hard work and experience. Her superiors at East Lake Elementary School in the Atlanta Public Schools system where she taught for six years seemed to agree. Administrators held her up as a model, praising her classroom management skills and use of technology and showcasing her class to parents and administrators, she says. But between 2007 and 2009 a strange thing started happening: Some of her colleagues' students began to outperform her students on the state's standardized test. Like similar tests throughout the nation, Georgia's is given annually to every public school student in grades 1-8. Test performance is tied to school, teacher and district evaluations and heavily linked to the fierce state competition for federal funding. "I started believing that I wasn't a good teacher," Rogers-Martin says. "Other teachers were coming in with these perfect scores and mine are not so perfect. I mean they weren't bad, they were just normal." Last month, 178 teachers and principals at 44 Atlanta public schools were found to be responsible for, or directly involved in, cheating on the state's standardized test, according to a report issued by the Georgia governor's office following an extensive investigation. Monday is the first day back to school for the Atlanta system since the report was issued. The report found that cheating occurred as early as 2001 and that repeated warnings were ignored by those high up in the Atlanta school system. Eighty-two educators acknowledged involvement, according to the report, and six principals declined to answer investigators' questions, invoking their Fifth Amendment right against self-incrimination. About 30 people have resigned or retired under threat of termination proceedings, according to APS. Educators who cheated "should lose the right to be in front of students," said Interim Superintendent Erroll Davis, adding that those implicated in the report "will not be appearing in front of children in the fall." Some educators could face criminal charges. Beverly Hall, who was Atlanta superintendent during the years the alleged cheating occurred, has retired. She has repeatedly denied any direct knowledge of wrongdoing. But Rogers-Martin knew none of this in 2007. She only saw a growing gap between her students' standardized test scores and those of some of her colleagues -- leading her to doubt her teaching skills. Teaching second, fourth and fifth grades, she noticed inconsistencies between her students' abilities and their previous year's standardized test scores. Some children with the highest rating on the previous year's test -- "exceeding expectations" -- arrived in her class completely unprepared for the coursework. She started asking questions: How is this child "exceeding expectations" on last year's test "when they can't read and they can't count?" she asked her principal. "Oh, I guess they are just a great guesser," Rogers-Martin says the principal told her. Sure, allows Rogers-Martin, maybe one kid could be a good guesser. "But eight or nine kids in every class of mine was a good guesser?" she asks incredulously. You can't go from not being able to read or count stuff on sticks to exceeding expectations in third grade -- it just doesn't happen. One second-grader who Rogers-Martin recommended for special education ended up "exceeding expectations" on the third-grade test. "I knew that was impossible," says Rogers-Martin. "You can't go from not being able to read or count stuff on sticks to exceeding expectations in third grade -- it just doesn't happen." The governor's report concluded that East Lake's then-principal, Gwendolyn Benton, erased and changed answers to improve test scores in 2009 and in other years and that she failed to adequately monitor and supervise test activities and test security. Benton, who retired in December, could not be reached for comment. Keith Bromery, director of media relations for Atlanta Public Schools, refused to comment on specific allegations of misconduct by employees implicated in the cheating scandal. At East Lake, as in all Atlanta schools, teachers and administrators stood to make tidy bonuses based on the percentage of students passing the test, known as the Criterion Reference Competency Test, or CRCT. At each school, the higher the pass rate, the higher the bonus. At an Atlanta school with the highest pass rate, every employee -- from the custodian to the principal -- got a $2,000 bonus. High scores also contributed to the success and prestige of Hall, who made tens of thousands of dollars in bonuses during her tenure as superintendent, according to the Atlanta Journal-Constitution, and was named 2009 National School Superintendent of the Year. At the state level, high CRCT scores helped Georgia compete for federal funding from programs like No Child Left Behind and Race to the Top. Teachers at East Lake and similar schools flooded with disadvantaged children were forced to compete for bonuses against teachers at schools serving mostly high-achieving, upper-middle-class children. This despite the fact that in study after study of student success on standardized tests, the biggest factor by far -- more than the quality of the instruction or the school -- is the social class of the parents and the community in which they live, says University of Arizona education professor David Berliner. At East Lake, around 90% of children in recent school years have been eligible for free or reduced price lunches -- an indicator for disadvantaged social class. Berliner says it is almost statistically impossible for students at a school like East Lake to pass at a rate equivalent to its more prosperous counterparts. And yet in 2008, competing against a number of schools with around a 10% free and reduced lunch eligibility rate, East Lake was the only elementary school to meet 100% of its targets, winning each employee a $2,000 bonus. If they were data driven, as the Atlanta system claimed to be, then high pass rates at a school like East Lake "should be a red flag," Rogers-Martin says. Instead, APS awarded the principals bonuses and accolades -- "My principal included: They were the 'cream of the crop.' "
Teachers throughout the Atlanta district say they were told to raise CRCT scores "by any means necessary." In 1999, near the beginning of her tenure, Hall promised that principals who didn't meet targets in three years would be replaced, according to the Atlanta Journal-Constitution, which brought the cheating scandal to light by reporting about unusual test-score gains at some schools. Hall made good on her promise, replacing 90% of the principals during her tenure, the newspaper reported. Teachers at East Lake Elementary were summoned each week to what Rogers-Martin calls the "war room" where "every child in your class that is not passing is posted on the wall." Describing herself as normally a happy and even-keeled person, Rogers-Martin says that during this time her anxiety level got to the point where she was unable to sleep and began taking prescription anti-anxiety medication. By school year 2008-09, Rogers-Martin says the principal was telling teachers: "You better get these kids up (passing the test). There are no exceptions -- zero can fail." In a school with so many disadvantaged kids, this seemed an unreasonable expectation, says Rogers-Martin. "Why can't you get your kids to pass?" Rogers-Martin was asked week after week by the same principal who had previously used her as an example of teaching excellence. The makeup of the student body made no difference, the validity of the previous year's scores made no difference -- or at least, no one would examine the possibility that they were fraudulent, according to Rogers-Martin. When East Lake was among the schools named in the governor's cheating report, Rogers-Martin says she felt vindicated. The report says cheating on the CRCT was rife at East Lake -- condoned by the principal and practiced by teachers and the principal in varied ways, from voice inflection and pointing at answers in the classroom to simply changing the answers after testing was complete. When Interim Superintendent Davis said he was "cleaning house" -- that no one who had cheated would ever be in front of students again -- Rogers-Martin felt a huge weight had been lifted. "It was the first time in a year-and-a-half that I thought that I could go back into the classroom without getting sick to my stomach." But Rogers-Martin is not gloating. Though she does not condone any of the cheating alleged in the report, Rogers-Martin is sympathetic to the teachers who may have felt they were pressured into altering scores or giving answers to students. Teachers, some faced with unreasonable targets, were cajoled and scared into cheating and were threatened with being placed on a Professional Development Program or PDP, she says. Though it sounds innocuous enough, teachers understood that a PDP could be the first step in losing their jobs, she and other Atlanta teachers said. "I have a husband who has a good job, so I could quit. I could say: 'There's no way! I'm not going to do this,'" says Rogers-Martin. "If I were a single mother and I had two kids' mouths to feed and this was my only job, I would hate to think what I would do -- I don't know." The Atlanta scandal was no surprise to Arizona's Berliner, who has long predicted that such cheating scandals would emerge from the emphasis on standardized testing in evaluating teachers and schools. Similar scandals have occurred in Washington, Houston and Los Angeles and more are bound to be discovered, he says. USA Today this March documented 1,610 cases of standardized test-score manipulation in six states and the District of Columbia between 2009-10. Economists and sociologists have long known that heavy emphasis on one narrow measuring tool encourages cheating in any sphere, from education to business to politics, Berliner says. Plus, Berliner says, standardized tests are designed to rate students, not teachers. "They are not designed to show any instructional effect. They are designed to rate a kid in relationship to other kids." But schools have to assess teachers somehow, says Neerav Kingsland, chief strategy officer of New Schools for New Orleans, a nonprofit that funded 10 charter schools to launch after Hurricane Katrina. New Schools has been held up as an example of excellence by U.S. Education Secretary Arne Duncan. "It seems odd to argue that, on one hand, teaching is extremely important, but, on the other hand, we should not try to measure the effectiveness of teachers. The two things go hand in hand," Kingsland says. Though they're not perfect, he says, standardized tests are still valuable tools for measuring teacher effectiveness. And U.S. Education Department press secretary Justin Hamilton says linking teacher performance to student standardized test outcomes -- as in federal programs like Race to the Top -- "allows us to spotlight success and to know where the challenges are so that we can help with support and professional development." But critics say there are better ways of assessing teachers. More nuanced evaluations by teaching experts paired with rigorous professional development opportunities -- as in Finland, often cited as one of the best education systems in the world -- would lead to better teaching and better morale, many experts say. It is not even clear that standardized tests are a particularly useful measure of student learning, says Marion Brady, a lifetime educator, former college education professor and author of "What's Worth Learning." "Nobody knows yet how to write machine-scorable standardized test questions that are able to measure anything precisely excepting memory," Brady says. "Memory is a thought process, but it's a fairly low-level thought process." "There's a whole range of thought processes: making inferences, generating hypotheses, and generalizing and synthesizing and valuing ... that every human being engages in every day, and nobody knows how to test them (with standardized tests)." When a country builds its education system around standardized tests, and standardized tests are incapable of measuring what needs to be measured, says Brady, "it's a recipe for catastrophe." The amount of weight put on tests for assessing not only students but teachers, administrators, schools and even whole states is what led to cheating in Atlanta on such a huge scale, Rogers-Martin says. Kids from underprivileged backgrounds can succeed on these tests as well as any kids, but "it's going to take them a little more time (on average) than it is other children. And there's nothing wrong with that." Standardized test results should be used as a guide for instruction, not a litmus test for employment or a full reflection of a child's academic ability, she says. "We need to see the whole child instead of one little set of scores that do not reflect the whole abilities of these children. That's the saddest part: Some of these (underperforming) children can really do very well -- if you do a portfolio or have them create something, they are extraordinary." "We stress them out because everything is about the test. And it's not fair to anyone: It's not fair to the children, parents, teachers and the school system."